Designed as instruments for professional use, Sinn's TESTAF Certified pilot watches must satisfy extremely high reliability and performance requirements. The Sinn EZM 9 TESTAF features an in-house Glashutte made 44 mm case comprised entirely of fully Tegimented Grade 5 Titanium that offers exceptional hardness and provides a scratch resistant finish. Additionally the hands are luminous and thus visible in dim light, and this function is complemented by an all-new minute-ratcheting sapphire covered pilot's bezel which allows for the numeral indices and primary marker to all be lumed. The total package is a watch that is highly visible and well suited for the cockpit but also lightweight and tough enough for everyday wear. 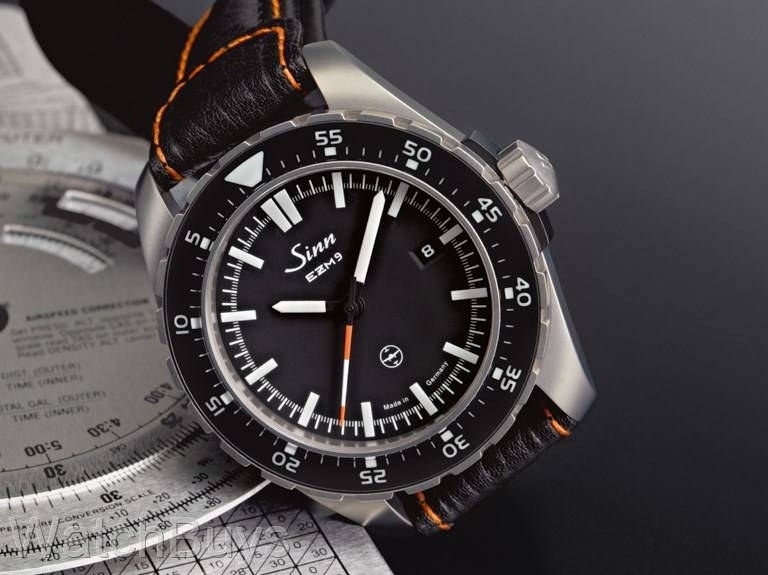 The Sinn EZM 9 TESTAF takes its design and technological cues from the flagship Sinn EZM 10 TESTAF but is perfect for those who do not need or want a chronograph complication. Another technological achievement is the fully-tegimented case made entirely of high-strength titanium at Sinn's case making manufacture in Glashutte, Germany. 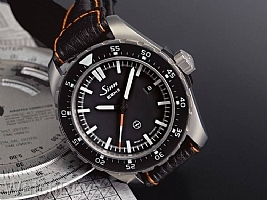 The Tegiment process, Sinn's patented case-hardening technology, was previously available only to those watches which featured a stainless steel case, which is quite heavy in comparison to titanium. As a professionally certified pilot's watch, the Sinn EZM 9 TESTAF needs to be light enough for daily wear yet also tough enough to resist scratching in an often cramped and busy cockpit environment, and thus the process to Tegiment titanium was invented by Sinn. This is only the second watch in Sinn's current production to feature Tegimented titanium, the first being the Sinn EZM 10 TESTAF. The watch is water resistant to 200 meters, and features a black calf-leather strap with water-resistant backing and orange stitching. Sinn introduced their new sapphire protected bezel with the Sinn EZM 10, and this feature has been incorporated into the design of the new Sinn EZM 9 TESTAF. The bezel is completely encased and covered by a sapphire crystal to offer protection from abrasions and other wear. Verified Owner Comments: This is my first Sinn and probably won’t be my last. The 44mm case works for my wrist size and the lightness if the titanium makes me forget I even have it on. Dial is super ledgible. And the orange stitching on the strap pulls the orange of the seconds hand in very nicely. The lume blazes at night and is still faintly visible the next morning if you charge it with a bright flashlight the night before. I also bought the corresponding titanium bracelet and switch with the strap occasionally. Matt was super helpful and knowledable. He mounted the case on the bracelet for me before shipping and provided the strap in the bracelet box. Highly recommended! "The best all around 3 hand watch"
Verified Owner Comments: I recently purchased the EZM 9, after wearing my Sinn 104 for about a year. I love the 104, but this watch is operating at another level. You get almost all of the Sinn technology (no Diapal, unfortunately, but everything else). You can swim in hydraulic fluid with this watch as long as you do not go deeper than 200 meters. It is anti magnetic, high and low pressure resistant, the works. Very clean dial and I love the sapphire covered bezel. I do not mind heavy watches and the lightness of the tegimented titanium case still surprises me. You probably need a diamond to scratch this case. All of this and it looks fantastic while keeping time as well as any COSC certified watch. German engineering excellence at its best. I have a dozen other watches but my Sinn's are my go to watches. I love them.